We can do everything for your event, from creating the menu to serving your guests. We offer highly trained chefs and service staff to help ensure your event is successful. We are committed to using fresh and seasonal ingredients for a high-quality, innovative dining experience. Let us exceed your expectations! What types of catering do you offer? On-The-Go Catering – Delivery/drop-off service – you can either have it delivered to your event site for a fee or pick it up at your favorite Haggen store complimentary in Whatcom/Skagit Counties. *Delivery in Snohomish County does have an additional fee. We offer wide array of menu options, including breakfast menus, sandwich/salad box meals, appetizer platters, a la carte menu for your entrees/sides, dessert, beverage packages, and so much more. All designed for buffet style service on disposable serving trays/pans. Full Service Catering – Personalized menu for every event and every guest. Displayed and passed appetizers, customized buffet menu or themed menu options, dessert and beverage services (including bartending), event staff for all your event needs from start to finish, chefs on-site (if needed), rentals, and so much more! Tell us about your chefs! Read more about our staff here! What is the history of Haggen Market Street Catering? Market Street Catering, a department of Haggen Fresh Foods & Pharmacy, has been around since the year 2000. Haggen has provided catering service since the early 1980’s, where customers in our amazing stores would be able to order various forms of platters and foodstuffs. Over the years it was determined that the creation of a central catering department would be essential to give our guests the highest quality of food and services with consistency. Our combined staff has over 75 years of experience in food service and catering industry, ranging from hotels, restaurants and of course the catering industry. In 2005, Market Street Catering added another level of services called Full Service Catering, where guests would be able to have events full catered – including the services of profession service staff, bartending, and on-site cooking. You do everything from catering to bartending to tastings. Is there anything you don’t do? Officiate the wedding, professional disc jockey (unless customized musical playlist off our phones count), host your wedding at our location (unless you love the food court). If we can’t do it, we can find someone else to assist. We do have our hands in a lot of things, but if we can’t do it, we know a lot of wonderful people and companies through our years of experience that can make those dreams come true for the couple. What’s a wedding tradition that Haggen Market Street Catering loves? The beauty of the Full Service Catering department is that we send our chefs, event staff to these beautiful venues/locations and they get to see all sorts of wedding traditions come to life, but also you get to see the personalized tributes to the couple getting married. Our Executive Sous Chef, Llodia Guerra, says she loves seeing when a friend/family member of the couple perform a song that is special to them or write a song specifically for their special day. It’s sure to bring out all the tissues for that really special touch to a beautiful moment between two people. 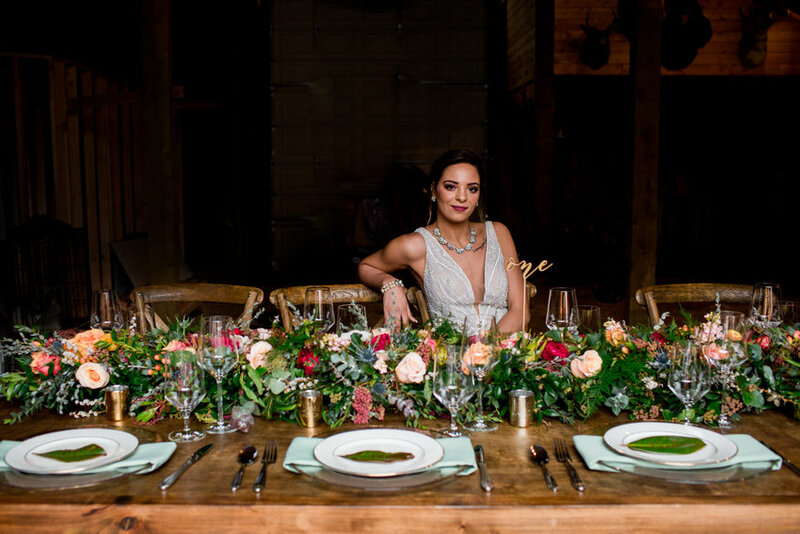 A note from the photographer: “We’ll shoot rain or shine!” is what I remember telling Diana, the wedding planner of Passionate Weddings when we started organizing a styled shoot at Winter Green Weddings venue in Buckley. The Pacific Northwest winter didn’t let us down either. Blue skies and sunshine teased us the day before the shoot, only to rain throughout the entire shoot. Thankfully, everyone was prepared for it, and the venue has just a beautiful space indoors as it does outdoors. What is your something blue?